Now the bees have a doorstep where they can pause and look around before take-off, and a bigger target to aim for on landing. These landing boards are an overdue improvement to the hives. These are lightweight landing boards which reversibly attach to the front of the hive, leaving no sticky-out pieces to get in the way when the hives are being stored or moved. I can’t quite remember who told me about this type of design, but it might have been CBKA’s Stephen Poyser. The landing board is also useful for observations. In the case of Queen Mab’s hive, it shows poo. The front wall of the hive was already indicating dysentry, and now the landing board has rapidly aquired the same signs. There is too much poo in this picture. This colony had the same problem last winter. Possibly, infection by the internal parasite Nosema apis is responsible. 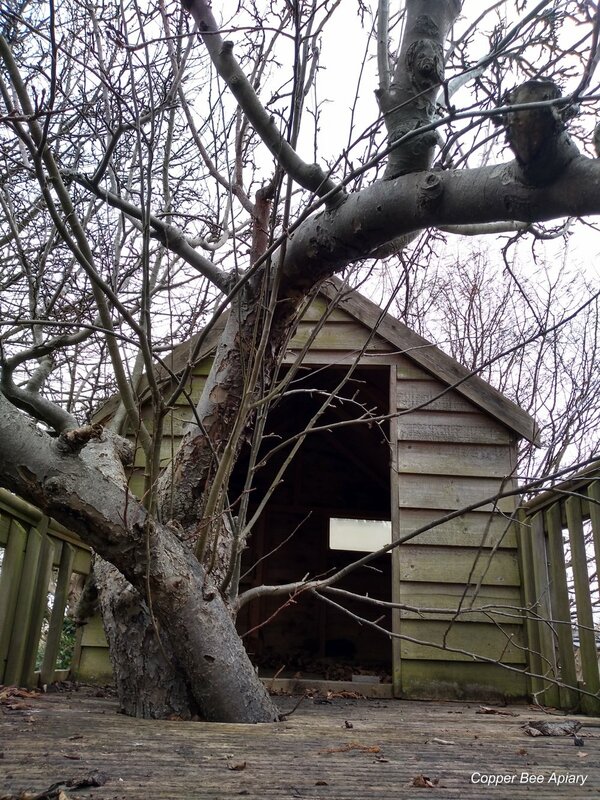 The old treehouse provided the source of wood. I broke it up into planks, which Richard sawed to length, provided with a bevelled edge, and put screws in. Ta-da! 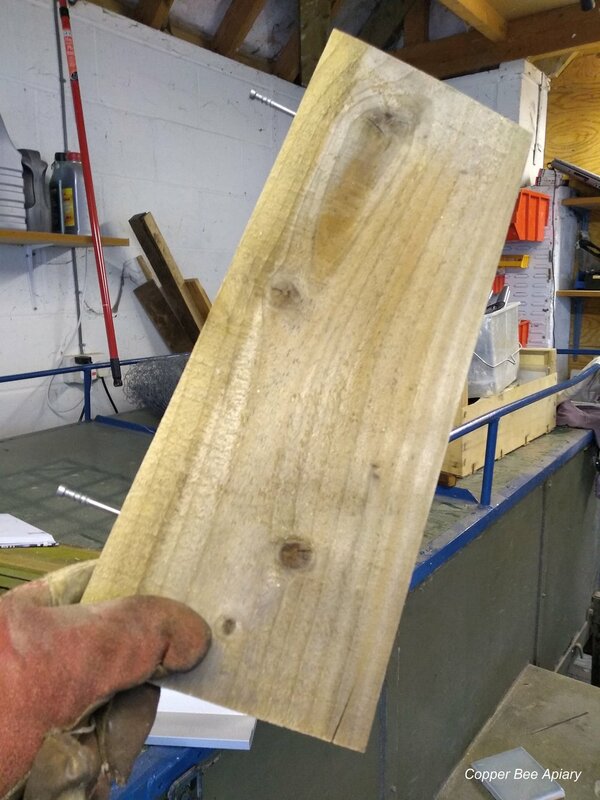 The first finished landing board. 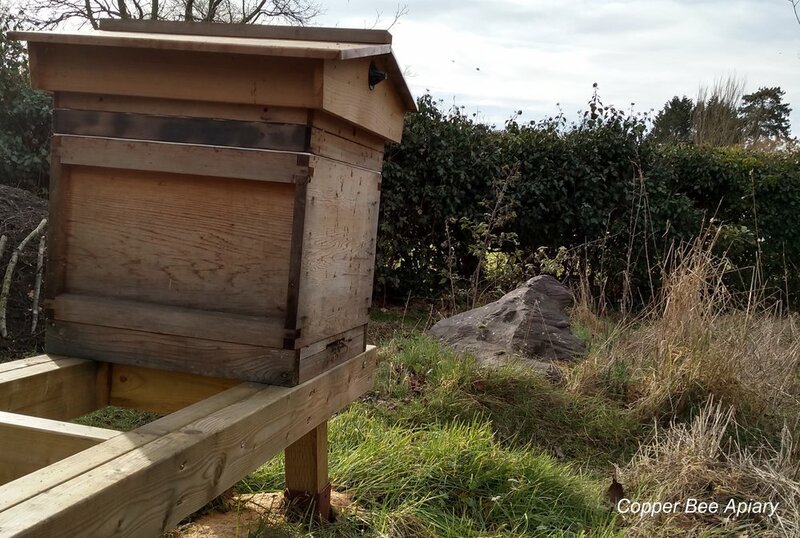 The protruding screws fit into holes drilled in the front of the floor section of the hive, so the bevelled edge sits flush with the hive front and the landing board has a gentle slope. We went through a couple of versions before Richard hit upon the idea of bending the screws so that they would fit into horizontal holes. Before that, our landing boards sat too flat (not enough slope for rain drainage) or were fitted into upward slanting holes (at risk of falling out). 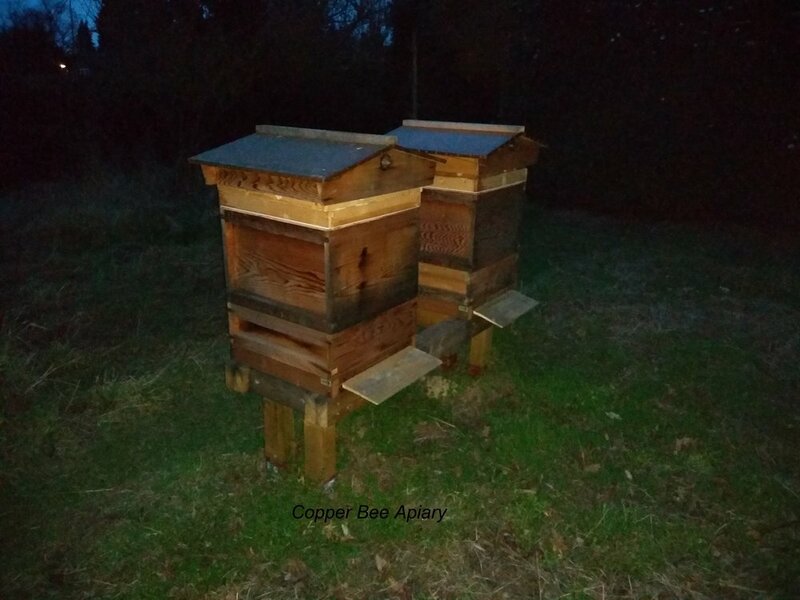 Having made a nice pile of landing boards, we fitted them to the three hives that needed them, at dusk when the bees were indoors. This involved some “stealth drilling”, which is when you wield an electric drill at a beehive and hope the bees don’t notice. Fortunately, the bees had better things to do than come out and see what we were up to. 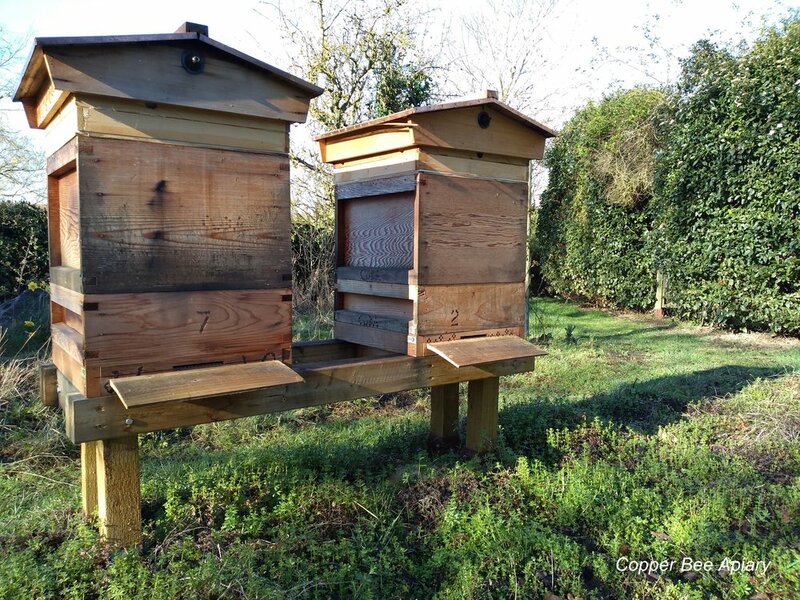 The next morning, when the sun rose, there were the landing boards for the bees! I think they like them. 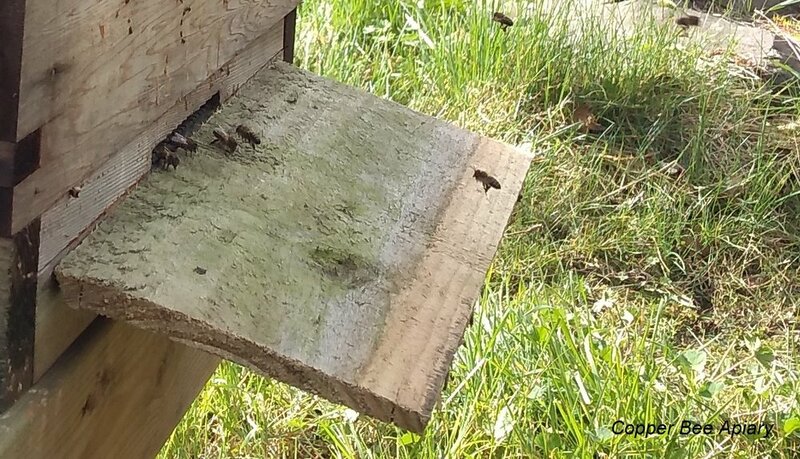 In this short video you can watch Queen Ottilie’s bees (front) and Queen Peony’s bees (back) coming and going from their landing boards. It’s windy, and the gust of wind you hear in the microphone blows a worker bee off-course.